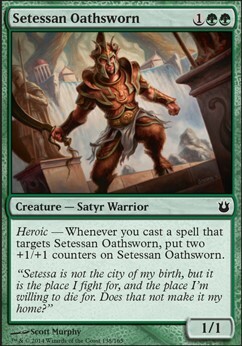 Heroic -- Whenever you cast a spell that targets Setessan Oathsworn, put two +1/+1 counters on Setessan Oathsworn. Say for instance I have a Agent of the Fates, Ashiok's Adept, Setessan Oathsworn and Mirrorwing Dragon in play and I play Bounty of Might targeting Mirrorwing Dragon, that triggers Mirrorwing Dragon, you then copy the spell 3 times, and target your 3 heroic creatures 3 times. That alone is awesome but, I dont think that's a heroic trigger at all am I right? Ok I see what you're talking about. The only problem (and I don't mean to be a wet blanket, just trying to help) unfortunaly Blinding Fog doesn't actually target Setessan Oathsworn so his Heroic ability wouldn't be able to give him +1/+1 counters. The trick is to look for the word "target" in the spell you're casting. In this case Blinding Fog isn't targeting anything, it's just applying an effect to creatures on the board. If, however, you were to cast Might of Old Krosa or Giant Growth targeting Setessan Oathsworn he would absolutely gain +1/+1 counters. 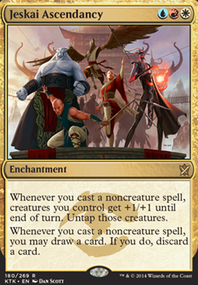 Another way to know if a spell is targeting without saying target is if the rules of the mechanic already require it. 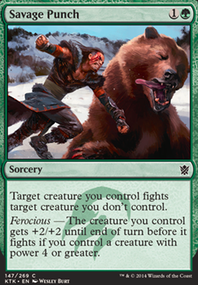 So even though Rancor doesn't say "target" you have to target a creature to be enchanted before you can cast it anyway. Could you explain how Blinding Fog and Rogue's Gloves makes Setessan Oathsworn a 7/7? If the Forest is a 0/0 elemental creature as your question implies, it will be put into the graveyard for having 0 toughness. 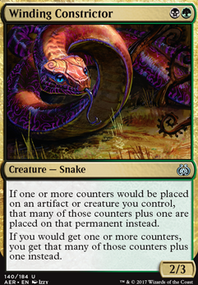 If your Forest is not a creatures and only has 4 +1/+1 counters by happenstance, you cannot target it with Bioshift. 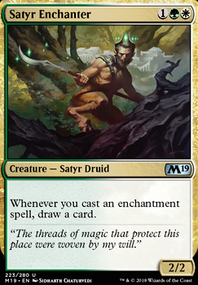 If your forest is a creature with base toughness greater than 0, it will survive the counters being moved and still be a creature. If the Forest is a 0/0 elemental creature you can also use Bioshift to only move 3 of the counters so it survives with the 1 remaining counter. Setessan Oathsworn doesn't grow quiet as large, but you still trigger Heroic so it's getting 5 counters when all is said and done which is a pretty big boost for 1 mana. If have a Forest with 4, +1/+1 counters on it, but I want to use Bioshift to move them to a Setessan Oathsworn for Example. 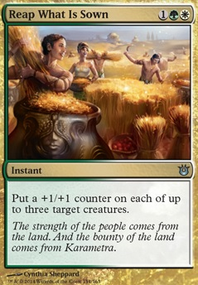 Is the land destroyed from the removal of all the counters, or does it convert back to a standard land? My assumptions are that the land would be destroyed. It looks like this deck was built from a limited collection of cards. While not an invalid strategy, you'll probably have more success by brewing a prototype here and purchasing the singles. If your expectations aren't too high, it's pretty easy to make a solid deck on a budget. To start with, I'd identify what cards, abilities, or strategies you like in green/blue and focus in one 1 or 2. Then, search around to see if anyone else has built decks with similar ideas. This may give you some inspiration for what cards and combos you want to build around. Just from what you have here, I see some paths you could take. Satyr Wayfinder and Tome Scour could be in a graveyard focused deck with cards like Splinterfright and Mindshrieker. Axebane Guardian and Crush of Tentacles could be in a ramp control deck with cards like Kruphix, God of Horizons and Plasm Capture. 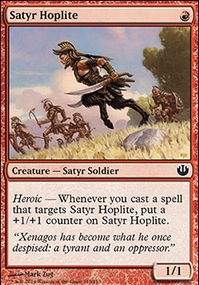 Setessan Oathsworn and Stratus Walk could be in U/G heroic with cards like Battlefield Thaumaturge and Solidarity of Heroes. All of that is just scratching the surface though. With some exploration, you should be able to find an archetype that fits your style. Then, you can get to adding the meat of the deck.